This massive tome clocks in at 195 pages, 1 page front cover, 1 page editorial, 1 page ToC, 1 page SRD, leaving us with 191 pages of content, so let’s take a look! First of all – what is Broken Earth? the easy answer would be that it is a post-nuclear campaign setting for Pathfinder, set in an Allotopia (an alternate reality of our own world for non-literature mayors) – this means that no magic is assumed to exist per se, though adding in rare magic would be no issue at all. Now the book kicks off with a vast array of crunch – from new races (ape-men and synthetic humanoids) and then receive archetypes – a lot of them – from the chem-head alchemist to scrappers, we get a cool selection here – now one peculiarity I *LOVE* about Broken Earth would be its awareness – its awareness of what’s out there. If you’re like me and have this great sub-system from 3pp XYZ, you want to use it – only every supplement seems to add a new one instead, often less refined. well, not so this book – from nodding towards Kobold Press’ Spell-less Ranger to Rogue Genius Games’ Anachronistic Adventurers-series (and the superb research-rules therein!) to Dreamscarred Press’ psionics, Broken Earth provides support for all of them and still manages to maintain functionality without access to them – everyone wins. Beyond that, a mechanic that balances character creation modularity with mutations and drawbacks makes for a cool way of handling racial restrictions and still maintain flexibility. The pdf also provides an array of equipment and vehicles, rules for radiation, overland hexploration and even sample communities and associated traits. We even receive a MASSIVE array of different supplemental options for the kingdom-building rules of Ultimate Campaign! Sounds familiar so far? Well, that’s because the generally known components have been released before in the separate player’s guide to broken earth, which I’ve also reviewed in much more detail – thus, if you’re interested in the details of the crunch, please check out this review. Now a general look at the page-count shows you that this pdf mostly of new content, but what exactly? Well, for one, the book is a campaign setting – but it’s also something different. When you hear “campaign setting”, you usually expect write-ups of different locations and nations, politics, history and the like – here, Broken Earth, while still providing that, sets its focus in a completely different way – and is better off for it. First of all, you’ll notice an unusual amount of scrappers, NPCs etc. all ready to drop into your campaign. Secondly, you’ll notice something different – think about Fallout, Wasteland and games like that – what’s their draw? Scarcity, exploration, a sense of desolation and lack -and the constant fear and wonder what lies beyond the next hilltop or dune. While the crunch sports rules for fuel etc., while there are pieces of information, extensive ones, that is, on tech levels etc., the result could have ended up as something a kin to a fantasy world with a post-apocalyptic spray-paint. That is NOT the case. From proper army statblocks to enclaves of high-tech hopes for a resettlement of earth, from mutants and supercomputers todrones, the narrative potential here is perfect – to the pitch. Whether you like your post-apocalypse gritty or over the op, this book supports all playstyles from Mad Max to Katmandi at Earth’s End to The Last of Us – whatever your preferred flavor of end-times would be, a certain spirit of the end-times suffuses every single component of the writing, an endzeitgeist if you will. Yeah. I’m gonna punch myself in the face later for writing that. (And no, I am not affiliated with this book in any way!) Essentially, the rest of the book is a DM’s toolbox akin to one massive, huge survival wilderness module – or AP. This book essentially doubles as its very own, superb campaign outline-collection – player-driven exploration and a vast collection of iconic locales drive an overall experience that is, by virtue of its very presentation, radically different not only in its spray-paint, but also in the experience. Exceedingly detailed hooks that can be developed in less than a couple of hours into inspiring scenarios suffuse the pages of this tome. Whether you just want a depths-of-humanity’s-depravity theme or rather have your PCs fight cyber-enhanced apes – this book has you covered and oscillation between themes and tropes can be handled exceedingly easily. From giant ants to telekinetic wolves to dragons (mutated, irradiated eagles with radioactive fire breath), everything you would ask from a basic post-apocalyptic bestiary is here. I could go on spoiling the details, the truth behind “Phoenix”, what can be found in the monster lands, comment on the pseudo-neo-feudal kingdom of Geneva…but I won’t. Editing and formatting are very good – while there are some typos and glitches in here, the overall quality, especially for a “small” 3pp like Sneak Attack Press, is damn impressive. Layout adheres to a beautiful 2-column b/w-standard that manages to remain printer-friendly. The original pieces of b/w-artwork are awesome and the cartography (the main map also comes as a full-color pdf with the book!) can also stand up to this level. The pdf comes fully bookmarked with nested bookmarks for your convenience, with one bookmark out of order – no biggie, though. I can’t comment on the quality of softcover/hardcover, since I do not own the print-version. Matthew J. Hanson has written singlehandedly what usually takes a team of authors. Usually, that is cause for alarm or at least, deep scrutiny. So I went through the checklist in my head: Settlement statblocks? Check. Full-blown kingdom building support, with modified end-times appropriate new content galore? Check. MASSIVE 3pp-support, though always modular/optional? Check. Proper grasp of psionics? Check. I’d drop the f-bomb now, but I know that some filters don’t like it. Just imagine me uttering it. I honestly didn’t expect to like this book – I, like so many others, have been waiting for Warlords of the Apocalypse for a LONG time. I have grown fond of RGG’s anachronistic adventurer-classes and did not expect them to be supported here. I was firmly in the WotA-bandwagon. Well, they are and this massive tome manages to get post-apocalypse just RIGHT. In all its facets, in its peculiarities and different flavors. Could you introduce banned classes and elements? Yes. Could you annihilate anything super-natural/sci-fi for a full-blown extreme-gritty campaign? Yes, you could. Vehicles, survival radiation, rebuilding civilization and settlements – this book offers just about everything I could ask for. And even if you don’t plan on playing in this Broken Earth, going full-blown steampunk, refluffing just about every rule herein to fit your tastes will still deliver a vast amount of content. Magical wastes, desolate planes – this book’s massive array of content, even when used in unintended ways, makes for a glorious grab-bag. 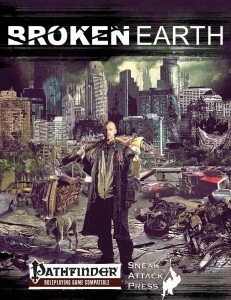 Broken Earth is the benchmark that any future take on the post-apocalyptic will have to surpass -and have an exceedingly hard time doing so. Is every component perfectly finetuned? No, but seeing how much we get, how much of that just oozes the right spirit, like a possessed radiation sore, this book has slowly taken me over. Broken Earth is one exceedingly awesome tome, one that will have anyone even remotely into post-apocalyptic games grin with glee. Add to that the more than fair, very low price and we have a glorious tome indeed – well worth of 5 stars + seal of approval and a nomination as a candidate for my Top Ten of 2014. You can get this awesome post-apocalyptic survival-hex-crawl-toolbox/setting here on OBS! You prefer Savage Worlds-rules? Here’s the SW-rules-version!